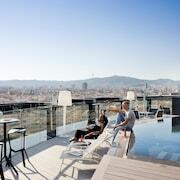 When planning your Catalonia sojourn, you will find an extensive selection of quality room options in Barcelona. On our comprehensive database you can browse 854 apartments and hotels within a 0.1-kilometre (0.1-mile) radius of central Barcelona. 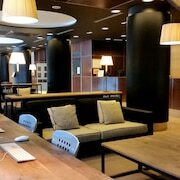 The more central hotels of downtown Barcelona are the Mercer Hotel Barcelona and Hotel Bagues. Gothic Quarter, 0.7 kilometres (0.4 miles) from the heart of Barcelona, is a popular accommodation neighborhood that has 101 Expedia-listed hotels. 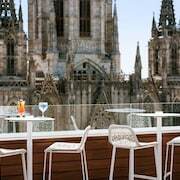 Some of the places to base yourself in Gothic Quarter include the Mercer Hotel Barcelona and Hotel Bagues. Another option is Eixample. This accommodation district is 2 kilometres (1 mile) from the middle of Barcelona. There are 261 hotels in Eixample, such as the Majestic Residence and Rent Top Apartments Passeig de GrÃ cia. You can also find a place to stay in La Rambla, which is the neighborhood where you'll find the Hotel Bagues and Hotel DO PlaÃ§a Reial, or Nou Barris, home to the SSG Borne Pop Art Lofts and ibis Barcelona Meridiana. El Raval is 0.09 kilometres (0.06 miles) from Barcelona's downtown, while Rambla de Catalunya is 2 kilometres (1 mile) from the middle of Barcelona. 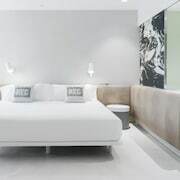 The Hotel 1898 and Casa Camper Barcelona can be found in El Raval, while the Hotel Murmuri and NH Collection Barcelona Gran Hotel CalderÃ³n are in Rambla de Catalunya. One of Barcelona's most popular landmarks is Sagrada Familia. The Hotel Arts Barcelona and Ciutadella Park Apartments, are within a 0.1 kilometres (0.1 miles) radius of Sagrada Familia. 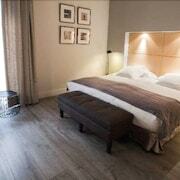 The ABaC Restaurant & Hotel and the You Stylish Business Apartments are both very near Casa Mila. The W Barcelona and the ALMA Barcelona are close to the Casa Batllo. Las Ramblas and Barcelona Cathedral are other much-visited Barcelona attractions. 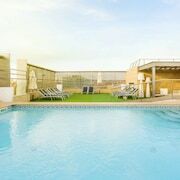 The Ohla Barcelona and the Rent Top Apartments Rambla Catalunya are near to Las Ramblas, and the Casa Fuster Hotel and the castro Exclusive Residences SPA Sagrada Familia, are near Barcelona Cathedral. The Omm and Renaissance Barcelona Hotel are closest to the University of Barcelona, while the Arai Aparthotel and Majestic Hotel & Spa Barcelona are within a short stroll of the Tivoli Theatre.â€¨ Those who are traveling to Barcelona for the Victoria Theatre could stay at the nearby Whotells Sant Antonio and Miramar Barcelona. Hotels to book that are that are near the Maritime Museum, include the Mercer House BÃ²ria Bcn and Arago312 Apartments. 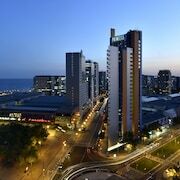 For those travelers planning on arriving through Barcelona International Airport, you may like to book accommodation at Barcelona Airport Hotel, or Hesperia Tower Hotel, both of which are a short taxi ride away. Explore Barcelona with Expedia.ca’s Travel Guides to find the best flights, cars, holiday packages and more!